This is a Combo that will bury your taste-buds in chocolate bliss. 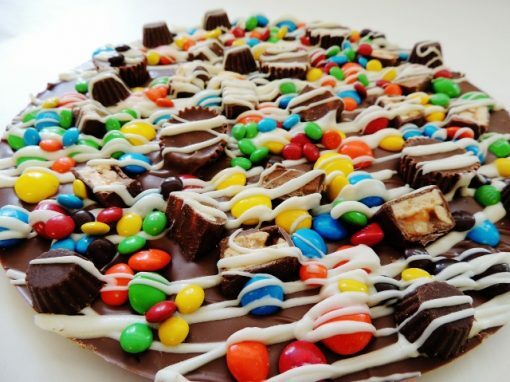 Start with our massive “regular” Candy Avalanche Chocolate Pizza that has our gourmet milk or dark chocolate blended with homemade English toffee and topped with a multitude of your favorite chocolate and peanut butter candies. Add a container of our famous Peanut Butter Wings – crisp, rippled potato chips covered in creamy peanut butter and dipped in rich milk or dark chocolate. – and you have a show-stopping “Pizza & Wings Combo”. Combo Avalanche Chocolate Pizza and Peanut Butter Wings is a taste combination that will bury your taste-buds in chocolate bliss. 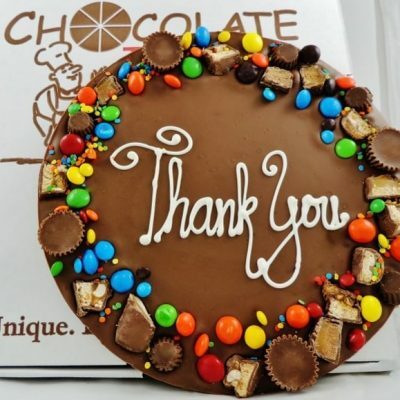 Start with our generous Candy Avalanche Chocolate Pizza that has gourmet milk or dark chocolate blended with homemade English toffee and topped with an avalanche of your favorite chocolate and peanut butter candies. But don’t forget the other half of the Combo Avalanche Chocolate Pizza and Wings and that is our famous Peanut Butter Wings. These are crisp, rippled potato chips covered in creamy peanut butter and dipped in rich milk or dark chocolate. 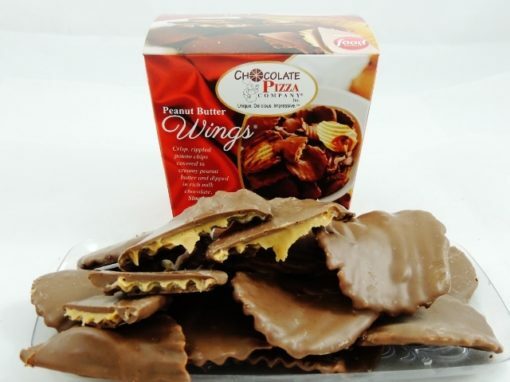 When you want a unique gift that will truly impress, look no farther than the, Combo Avalanche Chocolate Pizza and Peanut Butter Wings. 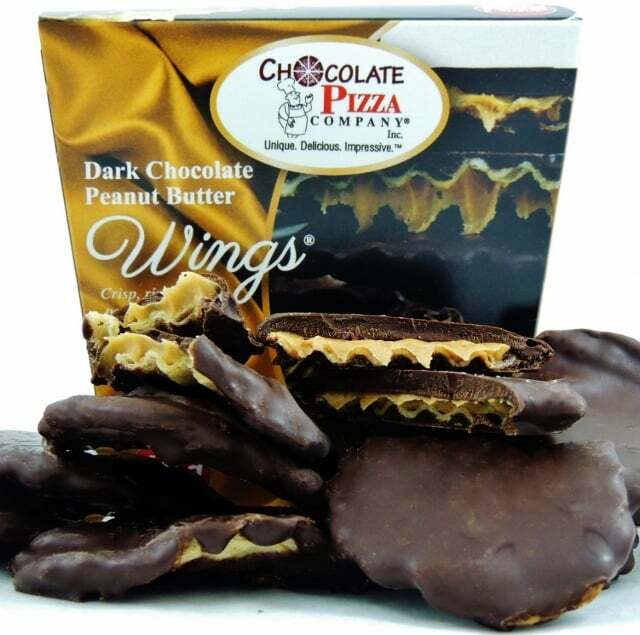 Chocolate Pizza Company has taken the traditional “Pizza & Wings” concept and turned it on its culinary head by creating the sweetest pairing imaginable – gourmet Chocolate Pizza® served with one-of-a-kind Peanut Butter Wings®. 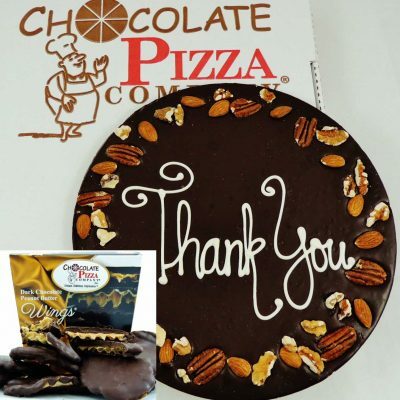 Made in America and handcrafted, Chocolate Pizza is a blend of rich milk or dark chocolate blended with homemade English toffee, topped with nuts or candies and served in a custom pizza box. Peanut Butter Wings are crisp, rippled potato chips covered in creamy peanut butter and drenched in our delicious chocolate. Together, this “Pizza & Wings Combo” is a one-of-a-kind gourmet chocolate gift for any occasion or holiday and has been the most popular offering at Chocolate Pizza Company for decades. 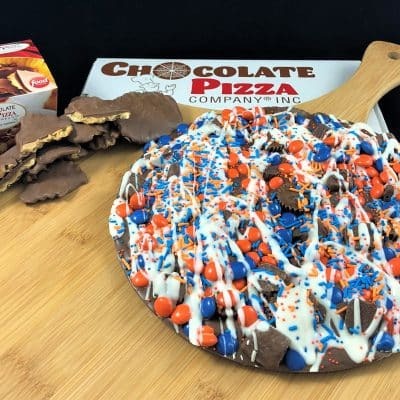 While the idea of a gourmet chocolate version of “Pizza & Wings” is unique to Chocolate Pizza Company, the roots of those two concepts stretch back quite far. The first recorded use of the term “pizza” was in the central Italian region of, Gaeta, in 997 AD. Based on an ancient flatbread it was topped with simple herbs and cheese. Pizza would arrive to the shores of America in the late 19th century with Italian immigrants. The first printed reference to pizza appeared in an article from the Boston Journal in 1904. “Wings” or “chicken wings” as we commonly know them today were started in Buffalo, New York in 1964 at the Anchor Bar owned by Teressa and Frank Bellissimo. The “wing” portion of the chicken was considered worthless at the time and often discarded or dropped in a pot to make chicken stock. According to the Smithsonian, the generally accepted narrative was that the wings were delivered to the bar one day by mistake and so rather than use them in their spaghetti sauce they created a bar appetizer by splitting them into “drumsticks” and “flats” and coating in a homemade hot sauce of cayenne and butter. The bar snack became an instant hit and customers immediately began ordering pizza with a side of wings – the “Pizza & Wings Combo” was born. 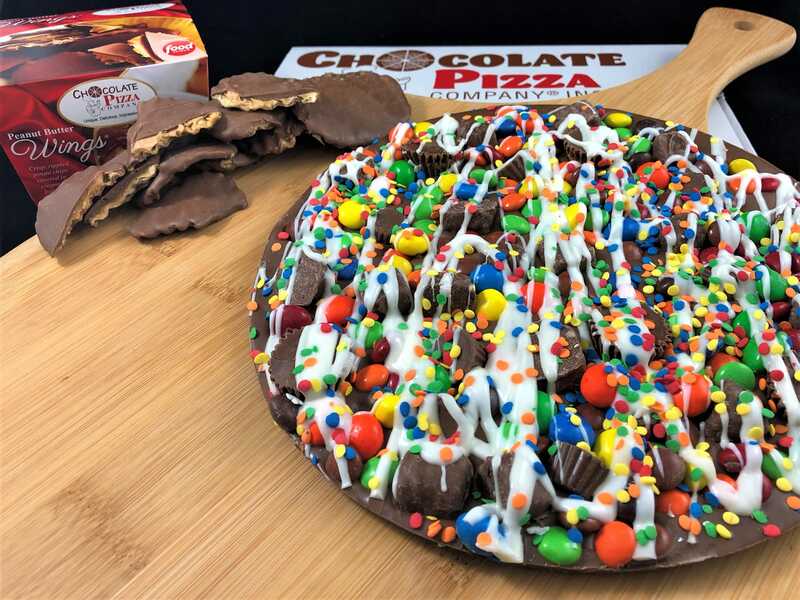 National media outlets have featured Chocolate Pizza and Peanut Butter Wings including Food Network’s hit show, Unwrapped, NBC’s Today Show, ABC News and Food Factory which aired on Food Network Canada. Whatever the occasion, business or personal, whether you need one “Combo” or thousands, this is a gourmet chocolate gift that everyone loves.